The AQUEFIER® Heat Recovery Unit captures waste heat discharged from the refrigerant cycle in an Air Conditioning or Heat Pump system, and transfers that heat into a water heater tank, thereby creating low cost hot water for domestic use. Not only does the Heat Recovery Unit substantially reduce the amount of energy required to provide domestic hot water, but it also improves the cooling efficiency of the Air Conditioner or Heat Pump while it is operating. The Model R6K is designed to operate with systems of 18,000 to 60,000 Btu/hr (1-1/2 to 5 ton) cooling capacity. Application The refrigerant side of the Heat Recovery Unit Heat Exchanger is installed in the refrigerant hot gas line between the compressor and condenser; or between compressor and reversing valve, if installed on a Heat Pump System. The water side of the Heat Exchanger is connected to the water heater tank to form a circulation loop. Power is drawn from the compressor contactor. Waste heat may be collected when the compressor operates, and the water circulating from the water heater tank is less than 140ºF. A minimum refrigerant temperature of 125ºF is also required to allow Heat Recovery operation. THESE SPECIFICATIONS SUBJECT TO CHANGE WITHOUT NOTICE. AQUEFIER® Heat Recovery Units may be mounted indoors or outdoors. They must be mounted vertically, at a height above the top of the condenser. While normally located outdoors near the air conditioning equipment, they can be located in any convenient place, such as the garage or laundry room; but the refrigerant run should be kept to a minimum. 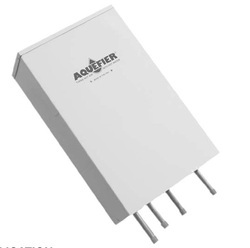 All AQUEFIER® models contain a water high limit control. It is factory set to 140ºF. Models also contain a refrigerant gas low limit. It is factory set to 125ºF. Models with optional freeze-protection are equipped with a water low limit. It is factory set to 50ºF, and is designed to operate when water temperatures of 40ºF or less are detected, in order to provide water circulation independent of compressor operation, in the event of freezing ambients. AQUEFIER® Heat Recovery Units contain a low wattage wet rotor in-line single stage circulator. Standard Models use a Taco 006 series circulator. This water cooled pump is rated at 90 watts, 230 volts and 0.40 amps. It is designed for 125 psi working pressure and up to 220ºF fluid temperature. The pump housing is bronze and the bearings are ceramic.